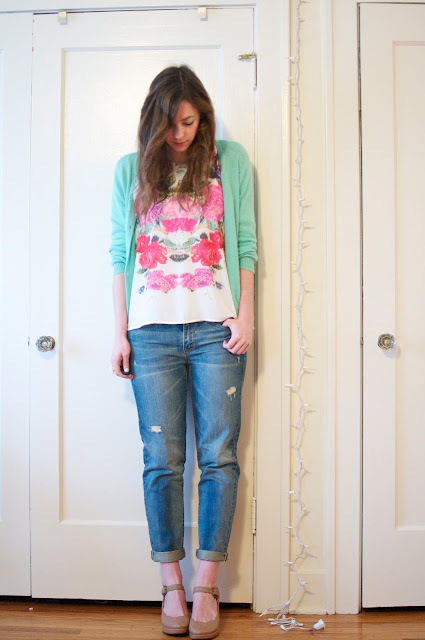 H&M cardigan and blouse, Gap boyfriend jeans, Jeffrey Campbell wedges. I'm really glad I found these slouchy boyfriend jeans because they seem like the perfect compliment to all my bright feminine colors and prints that I love for spring. I really like good contrast in an outfit, so pairing these tomboyish jeans with more feminine details is a fun way to accomplish that. Not too feminine, not too boyish, but something right in the middle. I'm also glad that I am able to wear such casual things to work. I work in a very laid-back office of mostly male engineers, so even throwing on a pair of heels with a casual outfit makes me feel pretty dressed up for the workplace. And for Portland, for that matter. 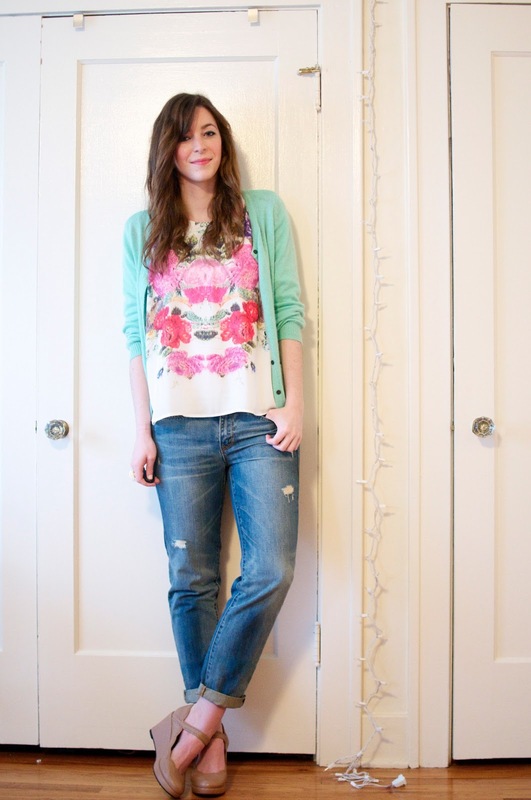 That being said, wedges with casual jeans are a perfect fit. I feel put-together but not out of place that way. #nowplaying - Vampire Weekend - "Bryn"
I was trying on a peplum top the other day and just happened to be wearing boyfriend jeans. I really liked the way they looked together - the perfect feminine/boyish balance. I love your floral top! I just came across your blog and I love it!